Benjamin Levie was born in Hoogeveen in 1863 as one of the eight children of Salomon Benjamin Levie and Rachel Breebaard. After Rachel’s death Salomon married Rebekka Isaak Zilverberg. From that marriage a son was born. On 23 July 1892 Benjamin married Grietje Sander-Kan, who was born in Meppel in 1866 as one of the six children of Sander Israel Kan and Vogeltje Lezer. Benjamin and Grietje had six sons, two of whom died young. Three sons became merchants; the fourth son Herman also died at an early age. He was married to Pamme Bloem, who would later marry his brother Mozes. Mozes had a shop in ladies’ underwear in the 2nd Hoofdstraat. He was also a musician performing in Meppel and surroundings under the stage name Max Vilé, a corruption of the name Levie. The other sons who followed in their father’s footsteps were Benjamin, who did not get on with his dad very well and who settled in Zwolle, and Jopie, who remained in Meppel. 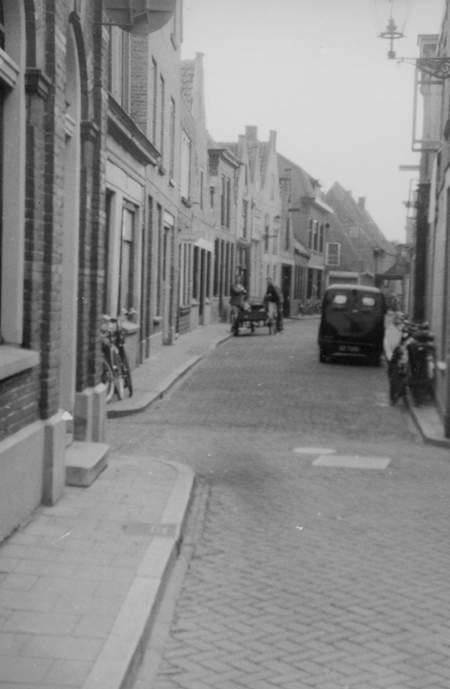 Benjamin came to Meppel in 1891 and lived in different places, first on the corner of Hagenstraat and Hagendwarsstraat, later at 16 Hagenstraat. He was a market vendor and as he sold blue enameled pans he was called ‘Pannechien Blauw’. He put his goods on a tarpaulin spread out on the ground. To attract the attention he beat with an iron bar on a pan every now and then. His usual place was the corner of Wheem and Grote Kerkstraat, in front of the pharmacy of Mr. Knoppers. When he went to other markets like Zwolle or Dedemsvaart, he put his goods on a fairly big handcart drawn by a pony or two dogs. One day in 1908 he went on this dogcart to the weekly market in Zwolle. On Werkhorst he harnessed the animals to his cart, as it was forbidden to ride on a dogcart in the streets of Meppel. The dogs got into a fight and cart and horses ended up in the ditch alongside the road. Benjamin jumped into the ditch to save his belongings. He managed to get things on the road again, but had to walk all the way to Zwolle, as one of the dogs was hurt. It lay on the cart next to the pots and pans. Benjamin got easily worked up and often had a row with a client. If people picked up too many pots and too often to his taste without buying, he got very angry. Especially when he was at loggerheads with a fellow vendor, he cursed and blamed his competitor and sometimes even flew at his throat, although he was only a short fellow. He once came to school to defend his son Herman. When the teacher, Mr. Sitters of the Jewish school, did not agree with him, he challenged him to a duel in the Stouwe, a rural area just outside Meppel. When Mr. Sitters refused, Benjamin left grumbling. In middle age he was appointed Bride to the Church, an honorary title, which resulted in more frequent church attendance. He also paid church taxes without grumbling from that moment. Maybe this was to ‘straighten things out with Jehovah’. Grietje died on 25 November 1941, at eight o’clock in the morning. 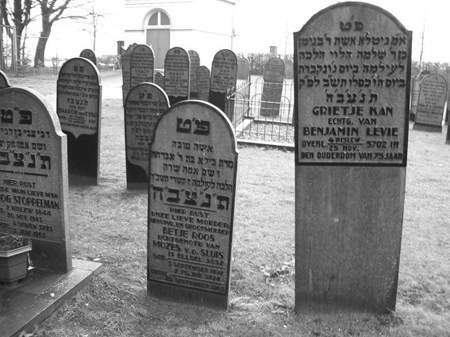 Benjamin Kroon, sexton and minister of religion of the Jewish congregation, reported her death to the Registry Office that same day. She was buried on 27 November. The gravestone of Grietje Levie-Kan at the Jewish cemetery on Steenwijkerstraatweg. Her gravestone is still to be seen (contrary to that of her husband). It is number 22, 6th row. She had been through a lot, but she was spared the journey to Auschwitz, fortunately. In the course of the year 1941 Benjamin had to close his business. In spite of his age, (he was nearly 80) he was still active in business. On 3 October 1942 he was fetched from his house together with many of his family members and taken to Westerbork. Two days later he was transported to Auschwitz, where he died on 8 October. 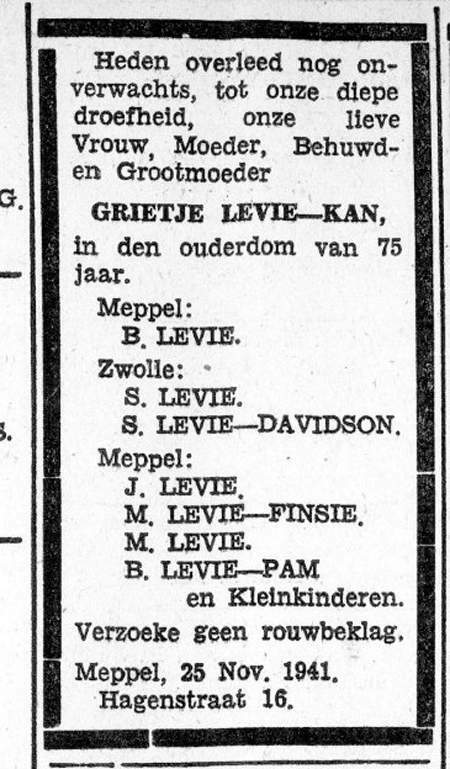 The announcement of Grietje Levie’s death appeared in the Meppeler Courant in 1941. I, the undersigned, D. Talsma, a ragman by profession, appointed collector of used material and waste products of the municipality of De Wijk, and also appointed to collect waste food etc. in the municipality of Staphorst, living on a houseboat owned by the rural district of Staphorst, politely request you to allow me to rent the house in Hagenstraat, formerly inhabited by Mr. Levie. The reason why I would like to rent this or another house is this. The barge we live in has been declared unfit to live in. It leaks like a sieve and is full of bedbugs. All the trouble we have taken to control this pest has failed. In Staphorst there is no house available. Our family consists of seven persons. In case Your Honour wishes to have an oral explanation I am quite willing to give this. In the meantime the house stood empty and the yard was a wonderful playground for the children of the area. Especially because everybody knew there were pots and pans aplenty, mainly stacked underneath a lean-to. Jacob Frank lived in Hagenstraat and played there with his friends. One day they found on a stack of pans a metal cigar box containing a lot of money. Jacob was startled and showed it to his mother. She looked at the treasure and thought her family could just use that very well, because her husband being a half Jew was not allowed to work. She took the box and ordered Jacob ‘never to mention it to anybody’. On 16 February1943, Omnia appointed Richard Bekker Sachbearbeiter to handle the liquidation of Benjamin’s business. On 13 August 1943 the business was deleted from the trade register.